I have been so busy lately that I haven't had time to play with nail art. 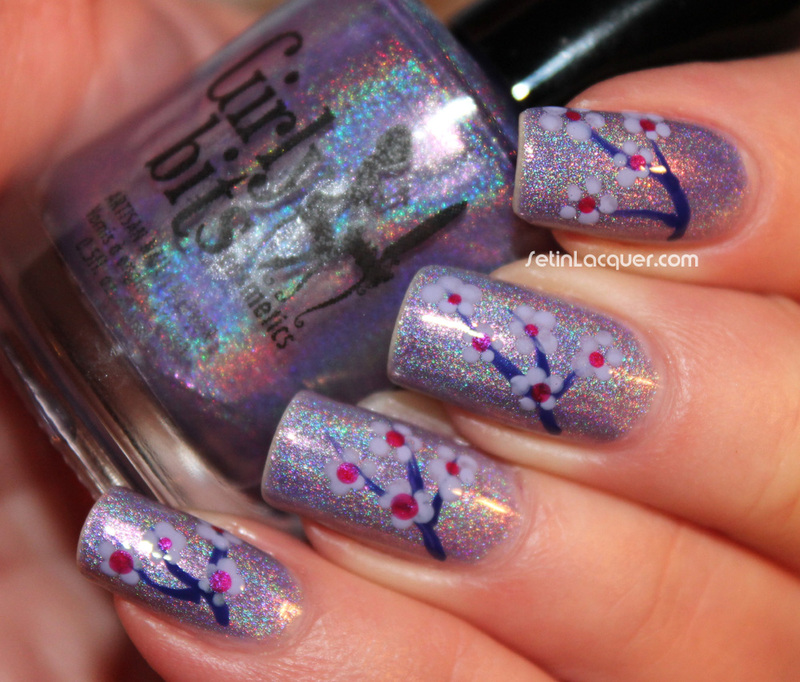 So I decided to add a little art to the polish I am currently wearing - Girly Bits Twitterpated. It's nothing fancy as I still don't have a lot of time but I rather like it. Sometimes when I start nail art I have no idea where it is going. So I added a few random lines of OPI Eurso Euro and then realized I wanted to do flowers. 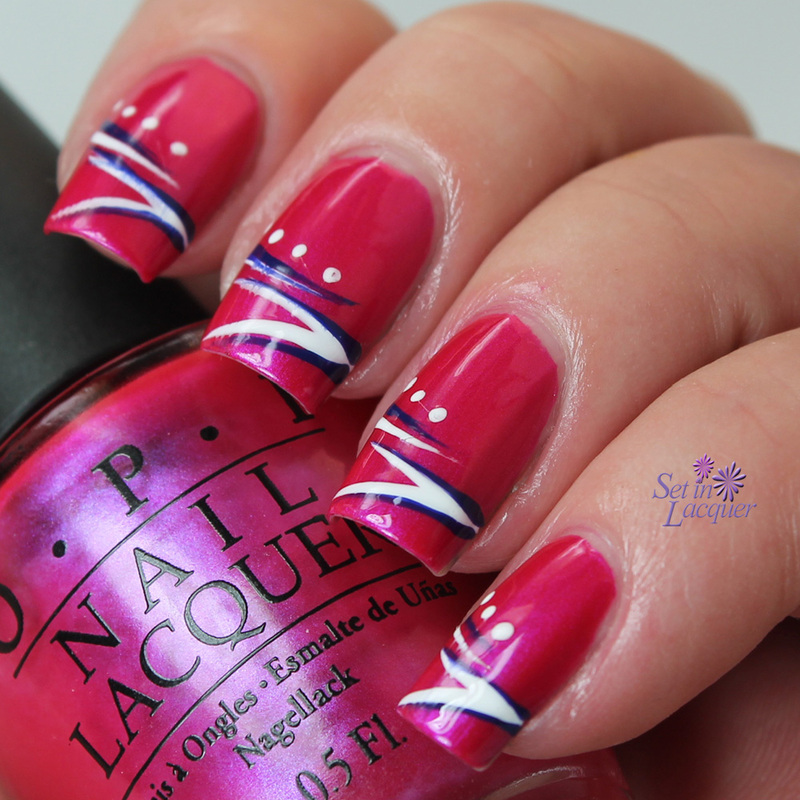 So I added dots of OPI You're Such a Budapest for the flower petals and dots of OPI Pompeii Purple for the flower centers. I like the subtle look of the soft cream of OPI You're Such a Budapest over the holographic polish. It was quick and exactly what I needed for my nail art fix. I love water marbles but they don't always love me. They can be a temperamental and persnickety method to use. But this one seemed to come together. 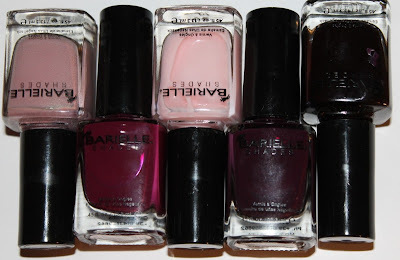 For the water marble I used Barielle Remember Me, Queen for the Day, Black Rose and Friday Night Party. 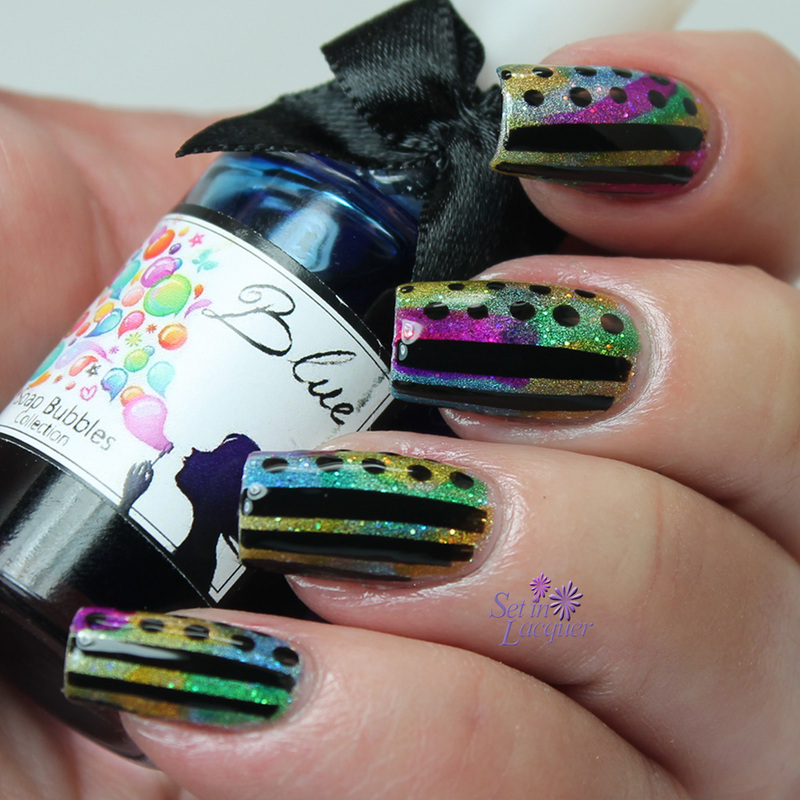 I used Barielle Greenwich Village for the light colored dotting. I always use distilled, room temperature water for marbling. 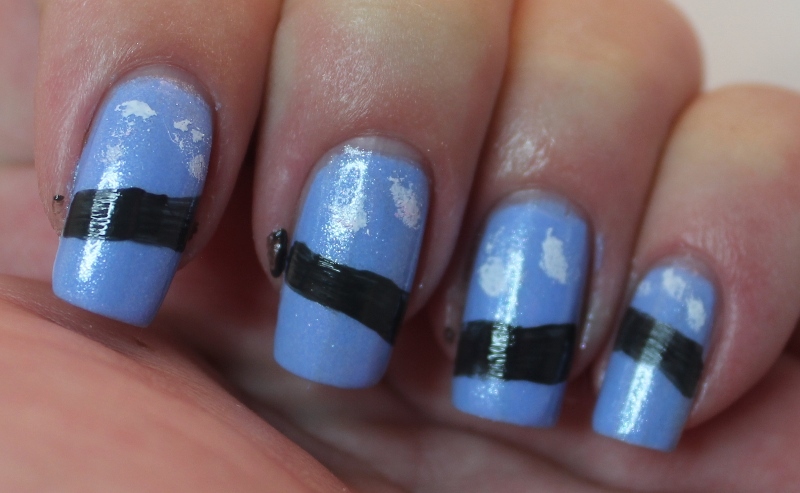 Putting scotch tape around my nails helps with clean up. I couldn't decide what to do to my nails tonight. So when I have that dilemma I usually go random. So here are my random stripes and dots. Let me say that Perrie has a wonderful formula. It applied wonderfully and dried quickly. Two coats gave me amazing coverage and a high gloss shine. 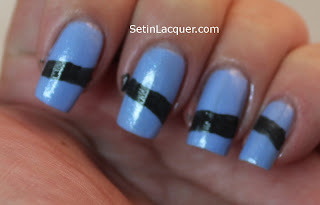 Then I made random stripes with a striping brush using Milani White on the Spot. A few dots of the dotting tool and I was done. Well almost... I thought it needed something to make it pop. 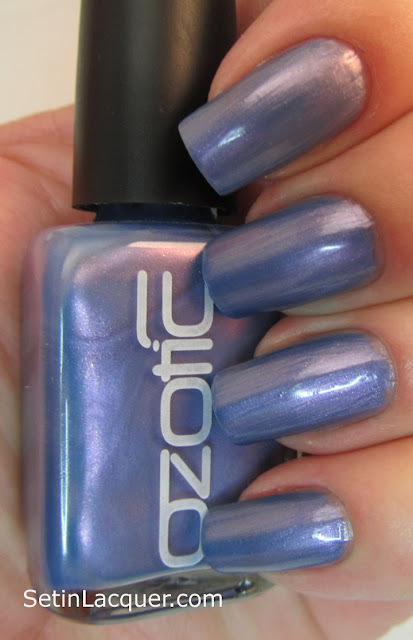 So I added a stripe of Zoya Daul for a little bit of subtle glitz. I like the end result. 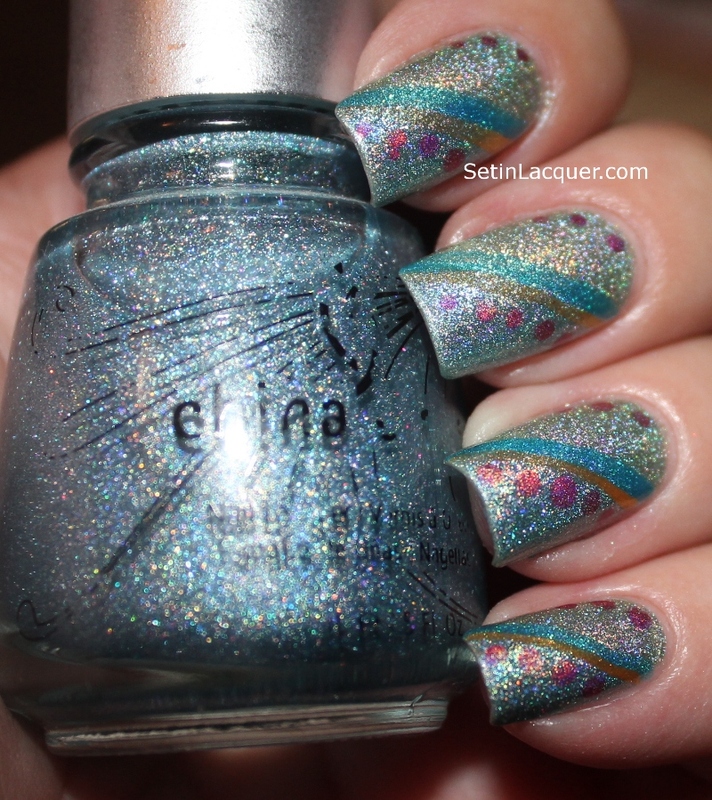 Zoya Perrie with random stripes and dots. I hope everyone had a wonderful Labor Day weekend. 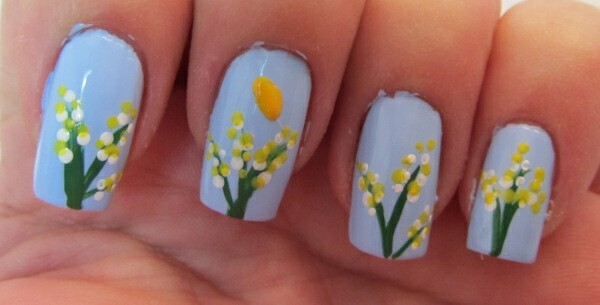 It may be the last hooray of the summer but you can sport flowers on your nails any day of the year. 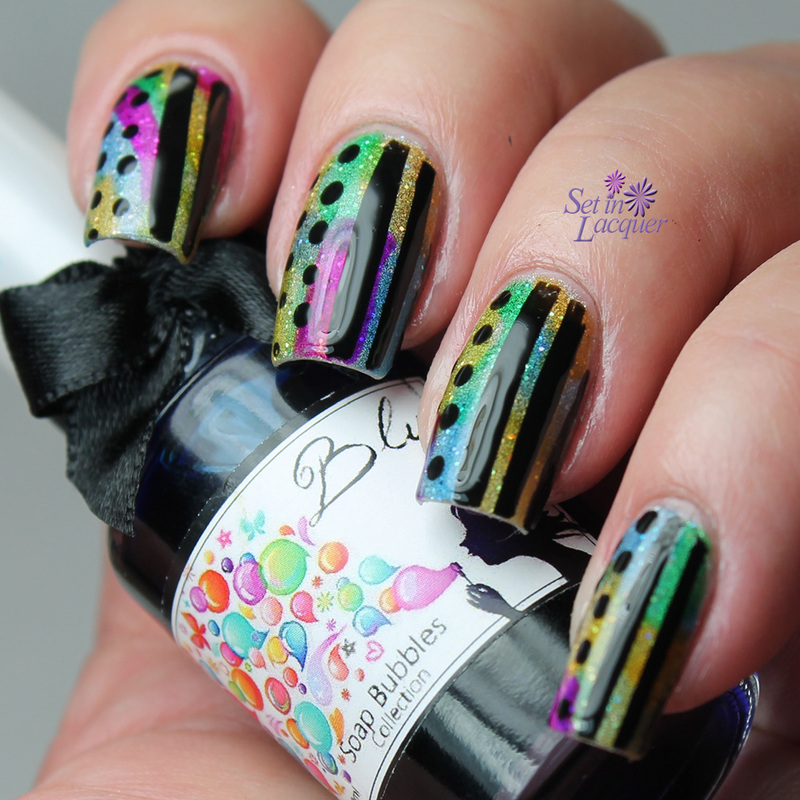 I used all Barielle polishes for this "dotticure." The base color is Island Breeze. The pink flower petals are Cherry Cordial and the gray dots are Snow Day. I just realized how Snow Day isn't indicative of summer weather but it does look nice on the teal and pink. If you don't have dotting tools you can make your own with various items found around the house - Toothpicks, bobby pins and even ink pens. What are your homemade tools for dotting? After doing a detailed mani and realizing it was extremely busy I decided to play around with my holographic polishes. I have the house to myself this weekend and get to play with polish. Life is good. 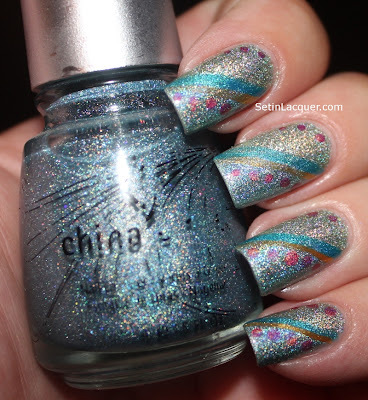 Holographic China Glaze Kaleidoscope Him Out and He's Going in Circles. For this I started with a base of China Glaze He's Going in Circles. For the diagonal tips I used scotch tape and then applied Kaleidoscope Him Out. The difference between the two colors is extremely subtle. Then I used gold and blue striping polish. A few dots of China Glaze BFF and it was complete. Well, it still needed a top coat. But simple it is. 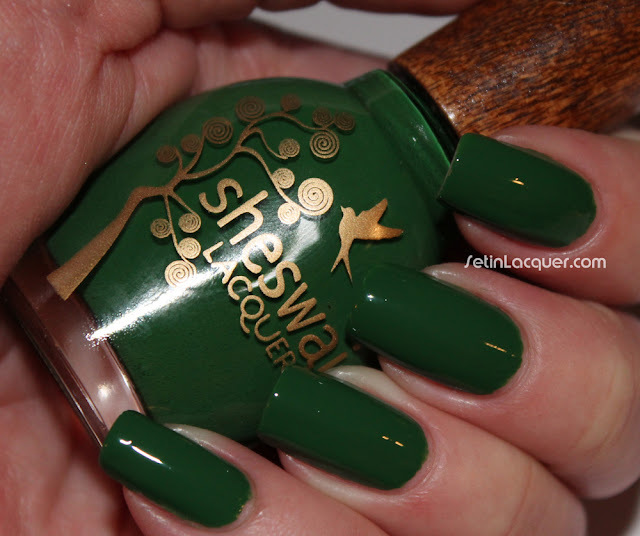 What are your simple yet effective polish secrets? I have had this idea in my head for a while. It honestly looked better in my head. I think this is kind of cheesy even though it is cute. I was going to use my acrylic paints but I put them away in a safe place. It's so safe I can't even find it! So I used nail polish, dotting tools, striping brushes and Qtips for this. 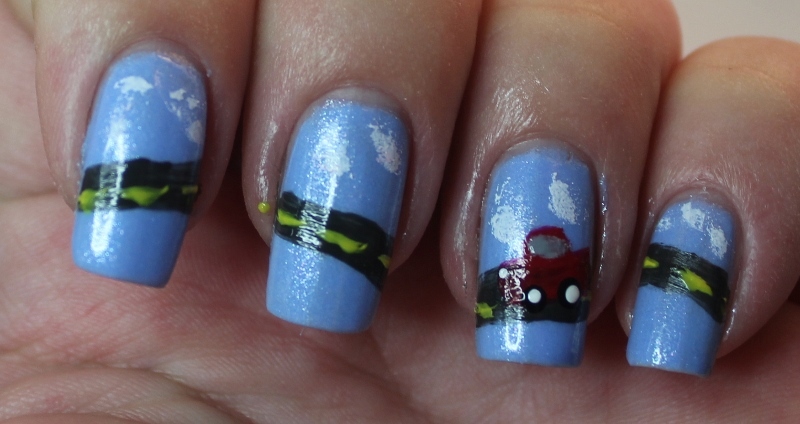 Then I used a nail art brush and striped on the road using Zoya Noot. For the clouds I used Milani White on the Spot and a Qtip. I used a yellow striping brush to draw the yellow stripes in the road. 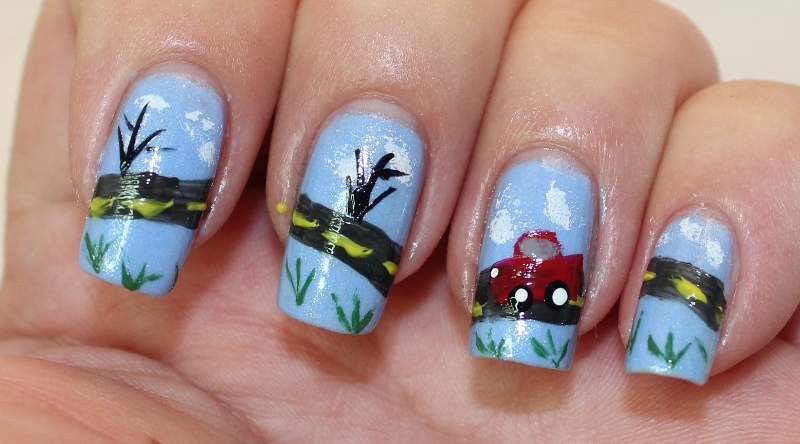 For the car I used Milani Rapid Cherry and a flat nail art brush. To add a little detail to the car I dotted black for the wheels, white for the hubcaps and headlight and brushed on gray for the window. 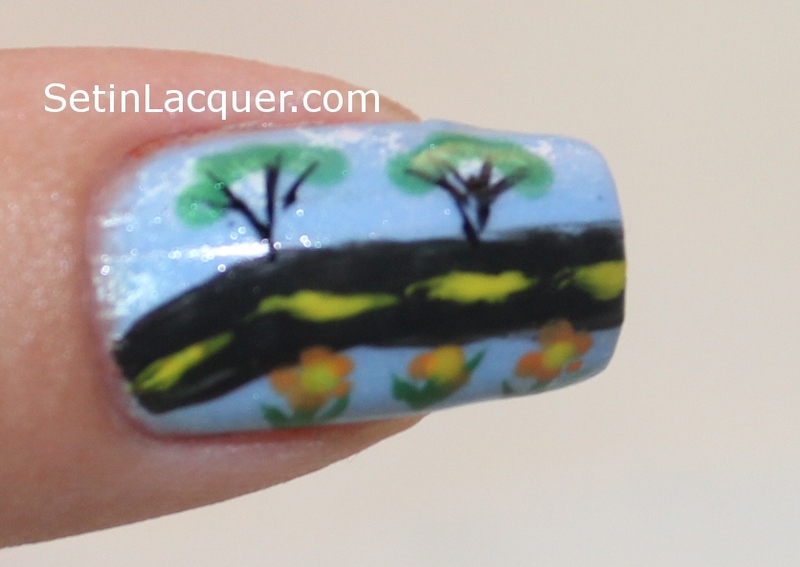 Then I used a green striping brush for the grass and a black striping brush for the tree trunks and branches. Then I used a dotting tool to add the flowers and the green on the trees. 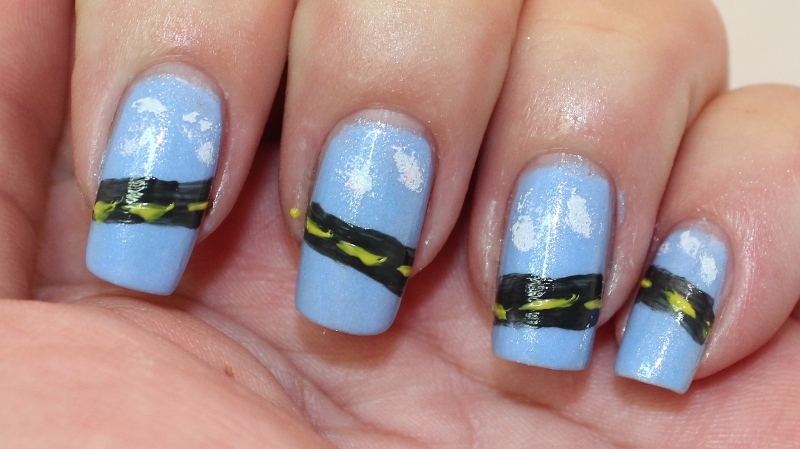 I added a bird using the black striping polish. Then I added a topcoat and I am done. Well the nights are cooler and summer is about over here in Wyoming. We may have another two months of decent weather or we might only have one month. So I am protesting the fact that Fall is approaching by staying in Summer mode. So I have some bright summery nail art to share with you. 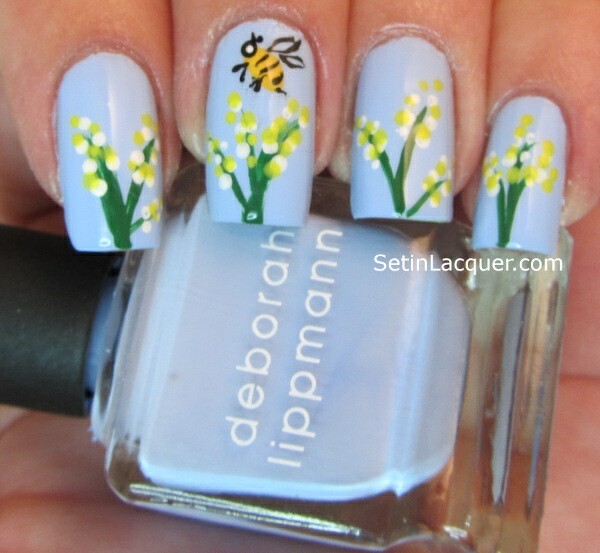 Bright flowers on green stems with a bumblebee... These were a lot of fun and actually quite easy. 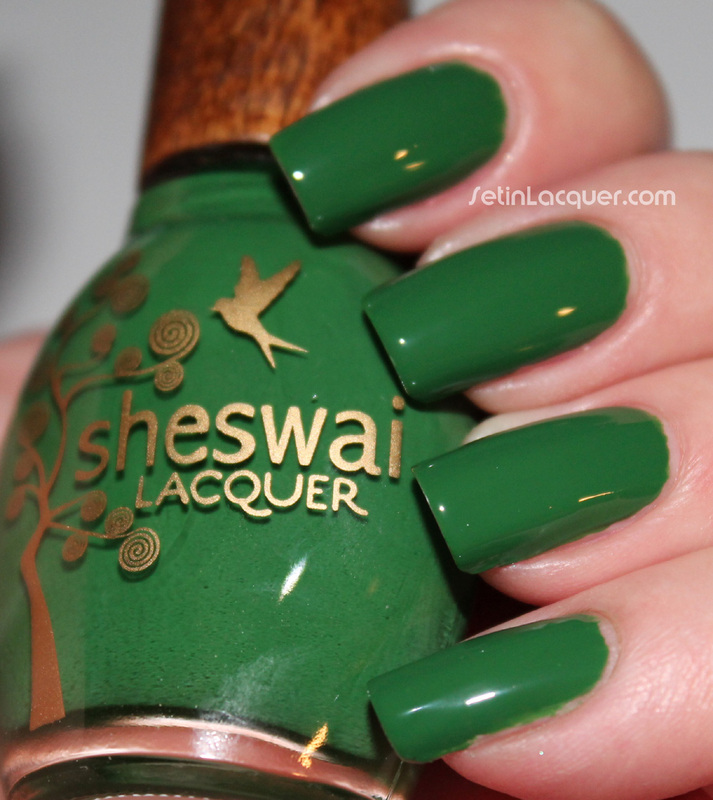 As always when I try to do a step-by-step post I get absorbed in the mani and forget to take pictures of steps. 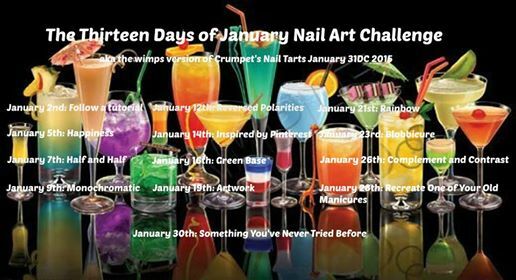 I started off with a base color of Deborah Lippman "Let's hear it for the boy." Forgive the messiness. 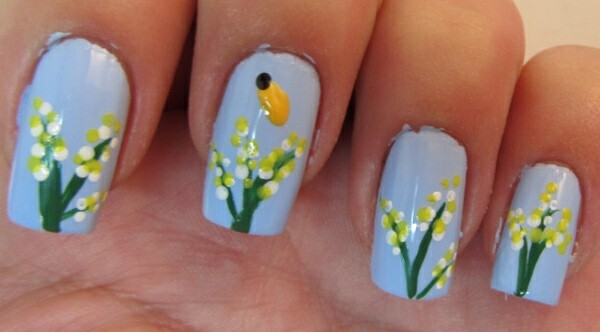 I never worry about being neat when I am doing nail art. I just clean up good with a brush later. Too many times I have done a few nails and decided I seriously didn't like it and started over. Then I used a green striping brush and applied three "stems." Different angles and thicknesses are okay. It provides some realism. Then I used a dotting tool and Milani "White on the Spot" to start the flowers. I used a different sized dotting tool and added dots of Zoya "Creamy" to provide the yellow in the flower. 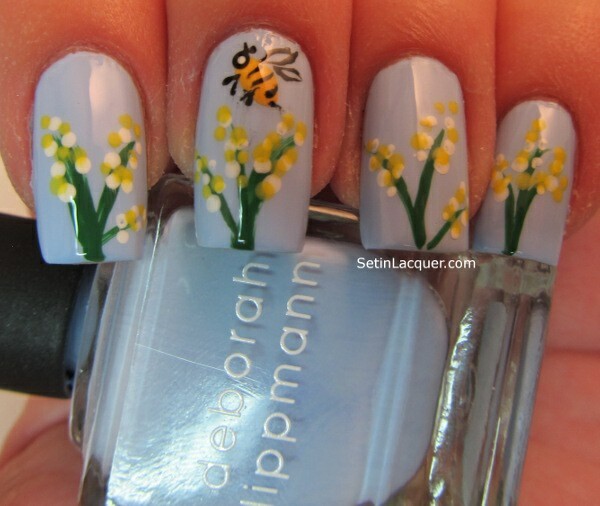 I mixed a little of Zoya "Creamy" and "Arizona" and used a larger dotting tool to make an oblong shape for the bee's body. Then using a dotting tool and Milani "Black Swift" I added a dot on one side of the orange oblong shape to make the bee's head. This is where I got completely focused and forgot to take photos. But it really was easy. I used a thin striping brush to paint on the three stripes for the body. I also drew on the antenna, feet and stinger. Not hard, but make sure you hold your tongue just right! Half circles meeting in the middle compose the wings. I added a tiny dot of white for the bee's eye and I was done! 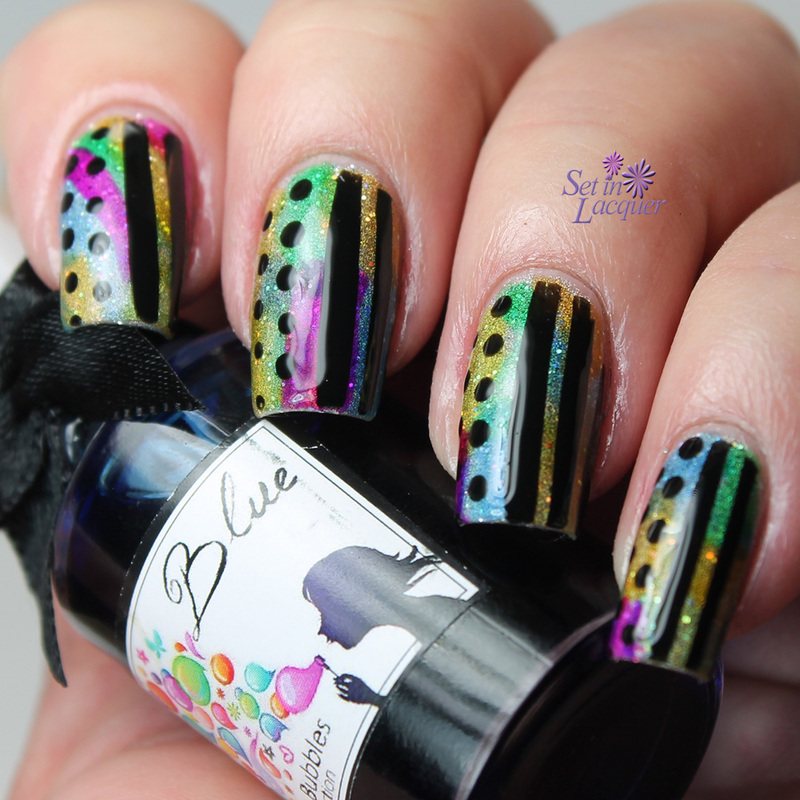 Several bloggers decided to have a "Dotticure" collaborative weekend posting. And I bet you can't guess what the theme is... Yep, you got it... Dots. Sometimes simple is better and that's what I was going for in this manicure. To be honest I couldn't bring myself to do flowers again. I had to make myself leave this one alone. I always think "Oh, I will just add..." and then I ruin it because I have tried to add too much. I used Barielle Swizzle Stix and Milani White on the Spot for the dots. 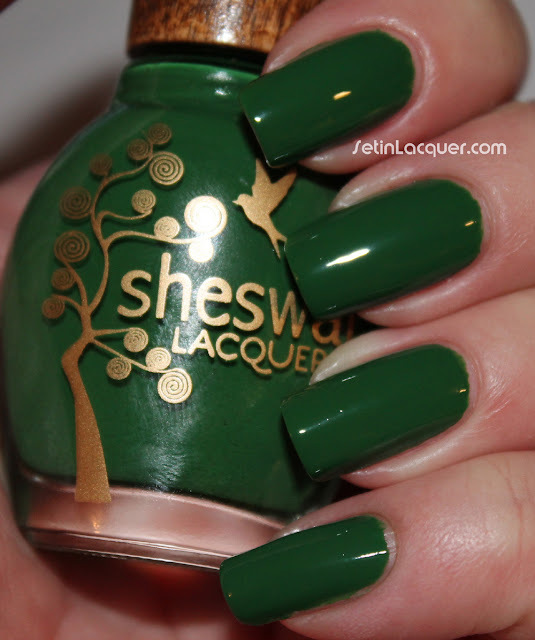 Check out some of the other dotted manis from these great bloggers. I couldn't decide what design to put on my nails today so I decided on dots. Dots are always creative and look different every time. I used Barielle U-Concrete-Me for the base. It's a wonderful light gray that is the perfect canvas for nail art. For the light blue petals I used Barielle Swizzle Stix - It's a great light blue cream. 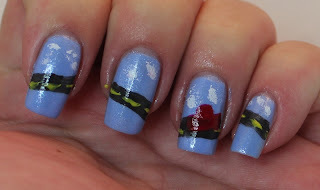 For the dark blue center of the petals I used Elle Seaside Chic. And for the center of the flowers and the random dots I used Barielle Berry Go Round. I am pretty pleased with the way it turned out. Using dotting tools is relatively easy and I have found the best way is to quickly dab the dot. Occasionally I get the spacing off though. What designs do you dot? After swatching like crazy I wanted to do something special. 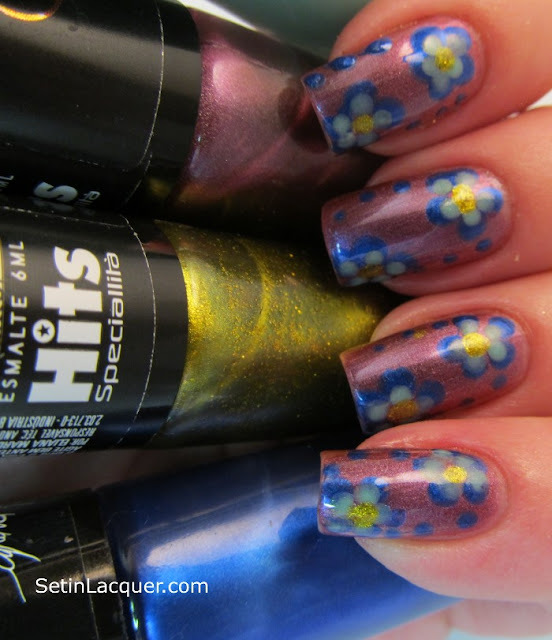 So I decided to leave on Chayene 04 and add flowers with the Hits polishes. I love it! I used Hits Chayene 04 for the base color. Hits Pedra Do Sol and Alana for the flowers. Hits Chayene 02 for the flower's center. I love the look. 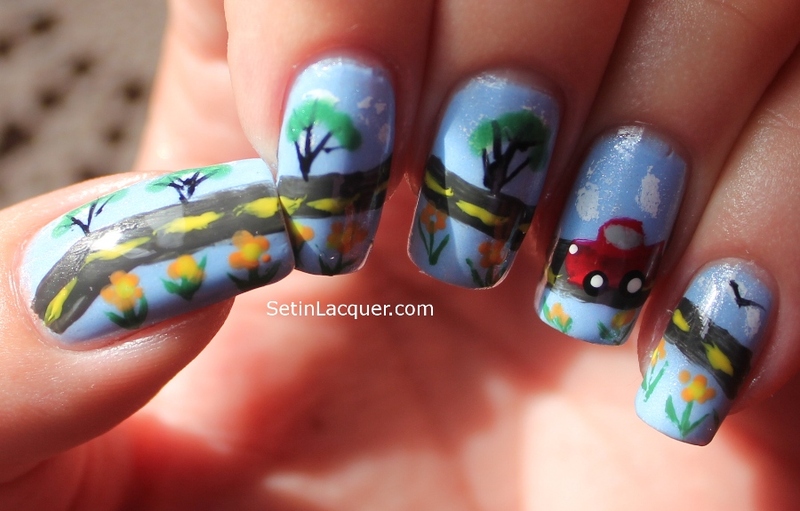 I will definitely add these to my nail art idea book. 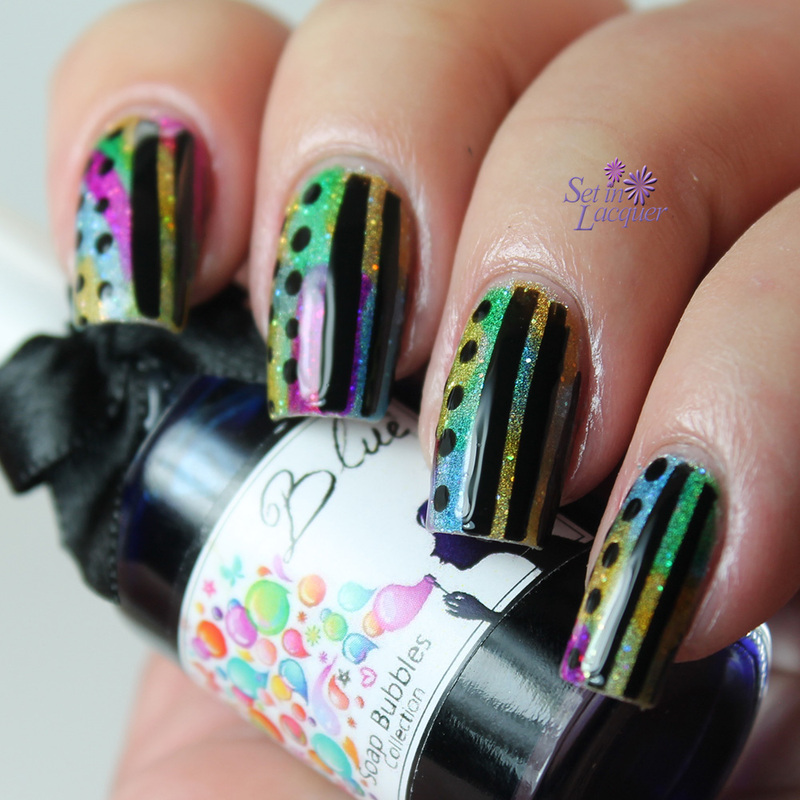 Dotting is a relatively easy method of nail art. Let me know what you think please. Nail art using Hits nail polish.